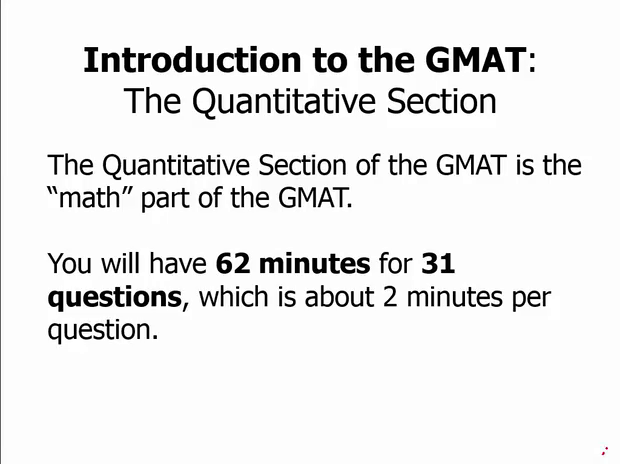 Now we talk about the quantitative section, as you probably know, this is what the GMAT calls the math part of the test. So that when you see Q, it refers to the math section, the Quantitative Section. You have 62 minutes for 31 questions, which is about 2 minutes for questions, so you're keeping a pretty good pace at doing these math problems. The Quantitative Section consists of two questions types and these question types are interspersed with one another. The first is called problem-solving and this is just ordinary five-answer multiple choice. Now you have seen this on standardized test, maybe the ACT or the SAT. You've seen this basically your whole life on standardized test. Ordinary multiple choice questions. The second type is unique to the GMAT. On data sufficiency there'll be a prompt that asks a question and it doesn't give you enough information. The question might be, something as bare as, what is the value of X? And there's, of course, no way to answer that question without more information. Then the prompt is followed by two statements, and as the test taker, we have to determine whether either statement or both statements allow us to answer the question, do they give sufficient information to answer the question? And so this is a very different way of thinking. In fact, we have several lessons just on the Data Sufficiency question, it's very important to get to practice this question, and get familiar with this because it's a very different type of thinking. On Problem Solving, as an ordinary multiple choice, the big question is simply what is the answer? On Data Sufficiency, it's a very different kinda question, do we have enough information to determine the answer? And in fact, sometimes finding the exact answer is a waste of time, it's not something you need to do. The question is purely, do we have enough information to find the answer? So again, a very different mindset for those. So we strongly suggest that you watch the lessons, especially the intro lessons on Data Sufficiency, and see if this question type is not familiar to you. So there are typically on the quantitative section about 11 to 13 data sufficiency questions, about 18 through 20 problem solving questions. And those are interspersed. So usually two or three of one, two or three of the other, two or three of one, two or three of the other, back and forth throughout the section. There is also no calculator allowed on the quantitative section. So you're gonna have to do all your math without a calculator. This may sound very, very scary, but first of all keep in mind that because there's no calculator, that places a tremendous limit on the writers of these questions. They can only write certain questions that can be done reasonably without a calculator. And also, keep in mind that just practising a little bit of mental math will get you a long way and, in fact, in our Math Strategy lessons, we'll have several mental math lessons that we recommend, especially if you're a little bit scared about not having a calculator with you on that day. So these are the basic topics and of course we cover all these topics in our Magoosh lessons. I will point out there's no trigonometry, no calculus so those are more advanced math. Everything is basically geometry and algebra two kind of level. Little bit of probability mixed in. It's hard to say where you might study probability and statistics. But very, very basic math, compared to trigonometry and calculus. And what's tricky about it, is just the way the questions are formulated and the critical thinking skills that the test requires. And really ultimately, as with everything on the GMAT, it's not so much do they wanna know if you know math. They want to know your critical thinking abilities and this is really what is being tested throughout this section.